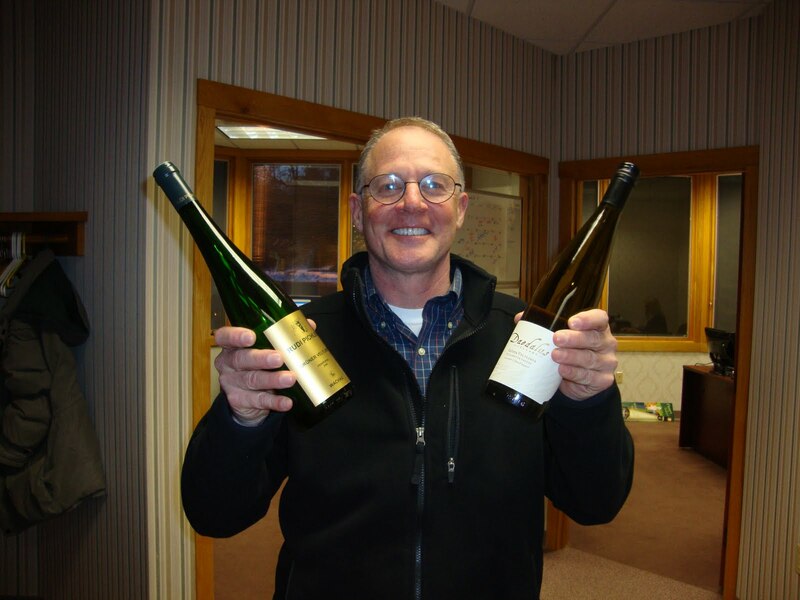 Thursday afternoon was a typical afternoon in the office except for the arrival of a much anticipated bottle of Grüner Veltliner. What made this Grüner Veltliner particularly interesting was the fact that it was not from the expected country of Austria, but instead was from somewhere much more domestic: Willamette Valley, Oregon. The wine: Daedalus Cellars Grüner Veltliner 2008 versus the Rudi Pichler Grüner Veltliner 2007 from the Wachau, Austria. It must be said that both wines were incredibly tasty, but as this was a taste-test comparison, one must be deemed better than the other. We began with the Austrian Grüner Veltliner to use as a reference point for those less familiar with the varietal in the office. The Rudi Pichler, Grüner Veltliner was a very elegant wine, with intense fruit aromas and incredibly balance. The wine has impressive length and proper integration of fruit, spiced white pepper and green apple notes. For more reference, there was a heated discussion with regard to who would be allowed to bring the wine home for further consumption that evening. This wine ranges between $20-$40/ bottle according to online retail sites, but we declared that this was a fair price point for a wine of such quality. All in all, we unanimously decided we liked the Pichler more than the Daedalus Cellars. Perhaps our palates are skewed from drinking so many Austrian Grüner Veltliners or perhaps we are biased because we know what Grüner Veltliner is supposed to taste like (think the French with Cabernet Sauvignon…) On the other hand, that’s the beauty of Grüner: it is entirely versatile. I’m happy to see Grüner Veltliner is becoming avaliable from other parts of the world – after all, that’s a sign it’s making it in the wine world, right?… every varietal has the potential to be the next Chardonnay.